Maca traditionally grows in the Andes Mountains of Peru, at elevations around 14,000 feet. It is a member of the Brassicaceae family, which includes plants like Brussels sprouts, cauliflower and turnips. It was long used as a food staple by native Andean populations because of its high nutritional value, but maca root also has medicinal benefits. According to "An A-Z Guide to Healing Foods: A Shopper's Reference," maca root has many health properties. Maca root is a vegan source of easily absorbed calcium, and it can boost endurance in athletes. The herb also acts as an adaptogen, which helps balance hormone levels. Maca is beneficial for the endocrine system and may be used to restore normal function of the adrenal glands, thyroid, pituitary system and hypothalamus. According to "Integrative Women's Health," maca root can help relieve some of the symptoms of menopause. It might reduce hot flashes, improve memory function, alleviate depression or boost low energy levels. According to the "Journal of Medical Nutrition and Nutraceuticals," maca root can also help increase menopausal women's libidos and reduce the risks of osteoporosis -- probably because maca root contains magnesium, iron, calcium and zinc. The journal suggests using 900 milligrams of maca root three times daily for menopause symptoms. Sexual dysfunction affects both men and women. Symptoms include a lack of desire, erectile dysfunction and vaginal spasms. 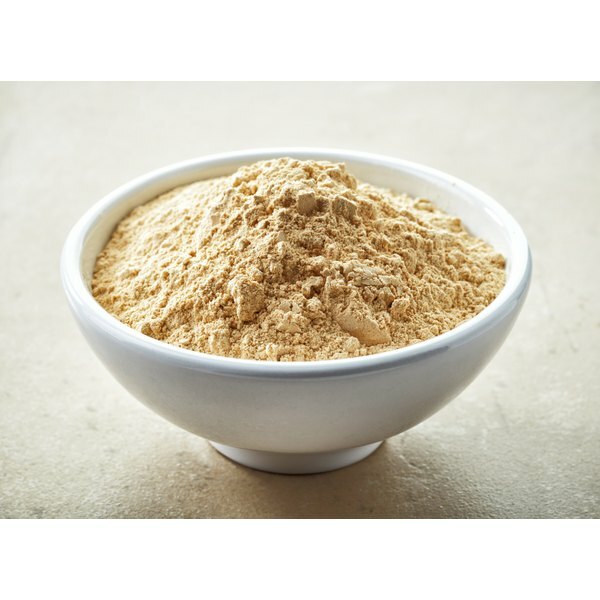 Maca root is purported to help restore normal sexual function. Scientific studies have yielded mixed results, necessitating further research. A review published in the August 2010 issue of "BMC Complementary & Alternative Medicine" found limited evidence that maca root assists in erectile dysfunction. However, a study in a 2000 issue of "Urology" found an extract from maca enhanced sexual performance in mice and rats, while a study in a 2008 edition of "CNS Neuroscience & Therapeutics" determined maca root might alleviate sexual dysfunction caused by selective-serotonin reuptake inhibitor antidepressants. According to Drugs.com, adverse reactions are unlikely. A study in the April 2005 issue of "Journal of Ethnopharmacology" found no toxic effects on rats given 5 grams of maca root extract per kilogram of body weight. Pregnant and lactating women should avoid using maca root due to a lack of established safety data.Drugs.com suggests 450 milligrams of maca root taken three times daily with food is the most standard dose.